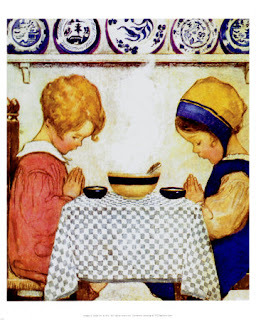 My homily this morning is on the “challenge” of giving thanks. Most people would agree (and rightly so!) that it’s a good idea to give thanks—and not just on one Thursday in November, but every single day of the year. They might not always recognize the fact that God is the one “from whom all good things come,” as we say in the third Eucharistic prayer—hence he should be the one to whom their gratitude is primarily directed—but they do recognize and understand that giving thanks is an important activity for them to engage in. And yet, it can also be a challenge—for them, and for all of us. In today’s gospel, for example, a healed Samaritan leper comes back to Jesus and gives thanks to God for his healing. That certainly makes him a lot more virtuous than the other nine lepers who were also healed that day but did not come back. However, the question that really interests me is: Would this man have done the same thing if he had not been healed? In other words, would this Samaritan leper have still been able to give thanks to God in the midst of his terrible illness, if it had not been taken away? Would he still have been able to find a reason (or a number of reasons) to say “thank you” to the Lord? Obviously, we can’t know with absolute certitude the answers to those questions, although we can certainly speculate on the matter. But there is one thing we do know for sure: It would have been much more of a challenge! Giving thanks after a great physical healing like the one this man experienced is relatively easy. Giving thanks when God says no to the request for a healing and allows you to go on suffering is far, far more difficult. But it’s just as important! In fact, it’s even more important—because crosses and sufferings are never completely absent from anyone’s life! So if we’re only going to give thanks when everything is “perfect,” then obviously we won’t be giving thanks very often! And we will be miserable—because ungrateful people are some of the most miserable people on the planet! I suppose all of this came to mind because of my own experience during the last 12 months. As most of you know, last December I was diagnosed as being in the early stages of Parkinson’s disease, which means that this is my first Thanksgiving since the diagnosis. Consequently it’s a very “challenging” Thanksgiving holiday for me. In all honesty, it was much easier for me to give thanks in years past when I had no major health issues to deal with. But the same is probably true for most, if not all, of you. You might not have Parkinson’s (and I pray you don’t! ), but that doesn’t mean you’re completely free from the challenge to be grateful. You might be challenged today in your thanksgiving by cancer, or heart disease, or diabetes, or lupus or some other serious ailment—or simply by old age. You might be challenged today in your thanksgiving not because your own physical health is deteriorating, but rather because someone you love is really sick. Or because someone you care about deeply recently died. Of course, it’s not only physical health problems that can challenge our willingness to be grateful in this life; we can also be challenged by other crosses and difficulties, some of which come into our lives with little or no warning: a lost job, a broken friendship, a failed marriage, a betrayal—the list goes on and on. I’m thankful to God for the love he has shown me through other people since my diagnosis. That love has been most evident through the faithful, daily prayers that are being said on my behalf—some by people I’ve never even met! I’m thankful to God for the opportunity this disease has given me to grow in empathy and in compassion for others. It’s much easier to relate to those who are suffering and to console them when you are suffering yourself. I’m thankful to God for giving me the opportunity through this illness to offer up some suffering in reparation for my sins and for other people—especially the souls in purgatory. Hopefully that will make my own experience of purgatory a lot easier! I’m thankful to God for using this illness to keep me from getting complacent in my spiritual life. We all tend to pray more—and to pray more fervently and attentively—when things are difficult in our lives. I’m thankful to God for the way this disease has made me more grateful for the little blessings of life that I experience every day—things I used to take for granted. I’m thankful to God for the motivation that Parkinson’s has given me to refine my priorities. Not that my priorities were way out of order beforehand, but they definitely needed a little “tweaking”—which is probably the case for most of us. And, finally, I’m grateful to God for the way that Parkinson’s Disease has made me more repentant. When you have a serious illness of any kind, you realize that, as the Letter to the Hebrews says, “We do not have here, on earth, a lasting city.” Consequently, keeping your relationship with God in good order becomes extremely important. Those are some of the ways that I’ve become more grateful to the Lord during the past year. Hopefully you can identify with at least some of them, based on whatever is challenging your gratitude at the present time. Of course, I look forward to a Thanksgiving Day in the future when I can stand at this very same pulpit and tell you that I’m grateful to God for something else: a cure or a healing. Now, I admit, it wouldn’t be very challenging to be grateful on that Thanksgiving Day—but it would definitely be nice! What exactly will be happening on the first Sunday of Advent? Now please keep in mind: the structure of the Mass isn’t changing, the two basic parts of the Mass are not changing, only some of the prayers within the Mass are. It’s because all the English prayers we use at Mass are translations from the Latin originals. The Latin originals are contained in a big book known as the Roman Missal. 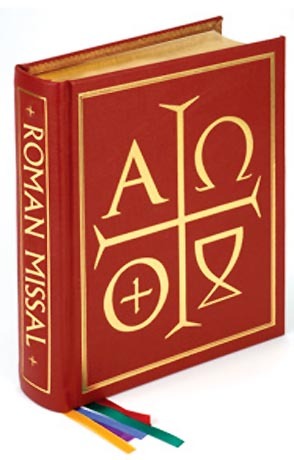 The Sacramentary—that big, red book that the priest prays from at the altar—is the current English translation of the Roman Missal. It’s been around since the 1970s. It will be replaced in a few weeks with the revised version. So the new translation is more literal, more faithful to the original Latin, and more theologically precise. But I warn you, for a time, it will also be more confusing! A lot more confusing. So we will all have to be patient: patient with the process, patient with one another. Initially we will make a lot of mistakes, but practice makes perfect, as they say. So please don’t be offended if I ask you to repeat a prayer or a response from time to time. They say repetition is the mother of learning. So the more we repeat these responses, the more likely we will be to learn them. We will also have these prayer cards there for you in the pews along with your missalettes. Please leave them in the pews; don’t take them with you. These will have the major changes on them that you as laypeople will need to be concerned with. So I may ask you at certain points in the Mass to pick up these cards and use them—especially during the Gloria and the Creed, because there are several changes in those prayers that will be hard to remember, at least initially. Now you’ll be happy to know that we won’t go over all of the changes during the next few weeks, but we will touch on some of the more important ones in our homilies, so that you’ll understand the “why” of some of the specific changes in addition to knowing “what” they are. Actually, if you’ve been reading the bulletin inserts that we’ve provided over the last few months, you already know some of these things. But it will be good to review them anyway. 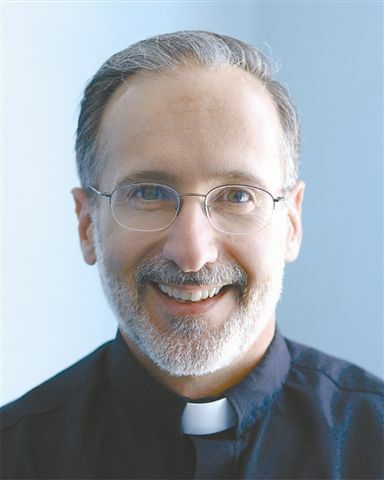 This has been changed because the new response conveys the idea more clearly that the Holy Spirit is active in the priest in a unique way at Mass, empowering him to offer the Eucharistic sacrifice. It’s also a biblical expression that we find in the writings of St. Paul. Some other words and phrases that will change in the Creed . . . In describing the birth of Jesus, the new version of the Creed uses the word ‘incarnate’—which basically means ‘given flesh’. Jesus was given flesh through the yes of the Blessed Virgin Mary. This is where we get the word “Incarnation,” which, thankfully, is a word that most Catholics have heard before. Instead of using two verbs to describe what happened to Jesus on Good Friday (the verbs suffered and died), the new version of the Creed simply says that Jesus “suffered death”. The point is that Jesus really died. His death was not an act or an illusion (which is precisely what some heretics in the early days of Christianity believed). One other change worth noting comes at the very end, where, instead of saying that we “look for the resurrection,” we will now say that we “look forward to the resurrection.” It’s a slight change, but it expresses a much more confident expectation of what awaits us if we live the Creed that we’ve just professed. I believe in one, holy, catholic, and apostolic Church. What Would You Do If You Knew You Were Going to Die Within the Next 24 Hours? What a nice way to begin your homily, Fr. Ray! What a lovely thought! Well, it may not be the most pleasant and uplifting thought we can possibly have, but it’s certainly a useful one, because it can help us to discern how close (or how far away) we are from true holiness in our lives. Try, as best you can, to imagine yourself in that situation I just described. 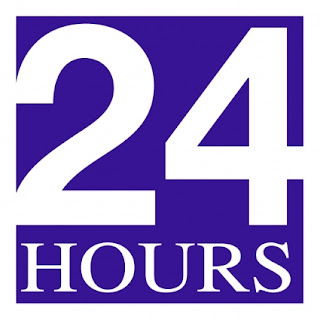 The doctor, in effect, has just told you that you have about 24 hours to live. What would you do during that time? What would you do during your last 24 hours on planet earth? Aside from saying goodbye to those you love the most, what would you do to get ready to meet Jesus Christ face to face? Is there anything that you know you’d need to do? For example, would you feel the need to make an appointment with a local priest (me or somebody else), because you know you need to confess some serious sins that you’ve never confessed before? Would you need to make peace with some people in your life? Would you need to say you’re sorry to certain members of your family, or to some estranged friends or co-workers? Would you immediately stop doing some of the things you’ve been doing habitually—on the internet or at the casino, perhaps? Would you feel the need to “clean up your act” as soon as possible? Would you feel a lot of regret for some good things that you didn’t do that you know you should have done? Would you say, “I wish I had been a lot more ___________ (fill in the blank: patient, forgiving, kind, understanding, committed to Christ and his truth, etc.)”? Would you say, “I wish I had prayed more often; I wish I had gone to Mass more often; I wish I had taken the Beatitudes and the other teachings of Jesus Christ more seriously in my life”? If you know yourself well—and if you’re willing to be brutally honest with yourself (and those are two very big “ifs”)—then reflecting hypothetically on your last 24 hours of life can be a profitable activity to engage in at least every once in awhile. It can certainly provide a powerful incentive to examine your conscience well. He had no need to run to church to confess any mortal sins; he had no need to go and ask others to forgive him; he didn’t have any major regrets about good things he should have done but hadn’t. He didn’t have the need to make any major changes before he left this life. So he figured he’d just continue doing what God wanted him to do that day, which was to plow his field. Today’s feast reminds us of what our ultimate end will be if we’re as ready as that saint was: we shall “see God as he is” (as St. John tells us in our second reading); we shall be part of that vast crowd that St. John couldn’t count in today’s first reading—that happy group of people who had washed their robes and made them white in the blood of the Lamb through baptism, and by living lives of faith and charity. There’s an old saying: Live each day as if it were your last, and one day you’ll be right. But not only will you be right; if you live each day in this way then in all likelihood you’ll also be ready: ready for death, ready for judgment, ready to meet Jesus Christ face to face. Which means that today’s feast day—the Solemnity of All Saints—will someday be your feast day!